The overt and devout references to God in Washington’s proclamation would likely bring sharp ridicule on a modern politician, but it’s easy to see why he and his fellow patriots would feel grateful. That generation of Americans had repeatedly accomplished the seemingly impossible during the preceding years. First, the colonists defeated a far superior military to win the War of Independence, a feat that required divine help from time to time. One of the more dramatic examples of seemingly miraculous help on behalf of the would-be nation was the Colonial Army’s retreat from Brooklyn in the late fall of 1776. Had General Washington’s troops made their stand at that time, they surely would have lost most of their army to death and capture, and the Revolution would have ended within weeks. The night of the daring retreat, the wind which had stopped the British ships from sailing up the East River suddenly ceased. The calm made the river-crossing possible. Despite the favorable conditions, the furious nighttime withdrawal took too long. With the break of dawn, the British forces would discover the retreating and vulnerable army. Just in the colonists’ most desperate moment, a dense fog blanketed all of Brooklyn. The fog was so localized that the other side of the river was clear as midday. And so the hand of Divine Providence protected Washington’s army, who lived on to fight for seven more years, eventually winning independence. America’s military victory was unlikely enough, but the fact that neither the military nor political leaders sought to establish their own autocracy was still more remarkable. The desire of so many of the Founders to give up, spread out, and limit their own power makes the American Revolution unique in all of history. Thus, the second seeming impossibility was that so many men of such talent and humility were gathered in the necessary place at the ideal time. Finally, with the war won and the intent to form a free nation found, there was no guarantee that the Founders would succeed in forming a good government. Indeed, historical experience suggested they would fail. And in a sense, they failed the first time around. The Articles of Confederation, which governed the states directly after the war, proved inadequate at limiting government power. Yet, despite the obstacles, the Constitution was successfully drafted and ratified, and a new government formed. The odds of winning in the war, finding power-shunning leaders, or succeeding at Constitutional Convention were minute. The fact that all three conditions (and many others unmentioned) occurred in precise succession must have seemed unbelievable to Washington — one of the few men who experienced each event firsthand. The first Thanksgiving of the new United States of America was truly a day to give thanks. Washington’s message, however, was not entirely of gratitude. His greatest desire going forward was that the federal government would always be bound by wisdom, justice, and the Constitution. That we may then unite in most humbly offering our prayers and supplications to the great Lord and Ruler of Nations and beseech him to pardon our national and other transgressions – to enable us all, whether in public or private stations, to perform our several and relative duties properly and punctually, to render our national government a blessing to all the people, by constantly being a Government of wise, just, and constitutional laws, discreetly and faithfully executed and obeyed. 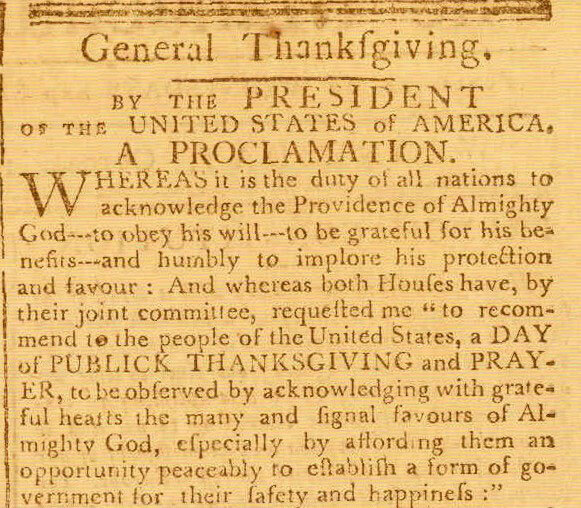 The underpinnings of Thanksgiving from the time of Washington extending back to the time of the Pilgrims were twofold. First was the heartfelt gratitude to the Grantor of our abundant blessings, and second, the recognition that God’s great gift to America is freedom. The fruits of that freedom will surround us this Thanksgiving. With the cars and planes we use to visit distant family members, or the modern appliances which we’ll use to prepare a bounteous holiday meal, or the exquisitely comfortable homes where we’ll enjoy both family and food, we have more to be thankful for than any people who have ever lived under heaven. Our blessings of abundance and freedom are great, but they are not a given. It was the dedication of Washington and many others coupled with the “favorable interpositions of [God’s] providence” which laid the foundation upon which we build. On this Thanksgiving, let us remember why we celebrate. 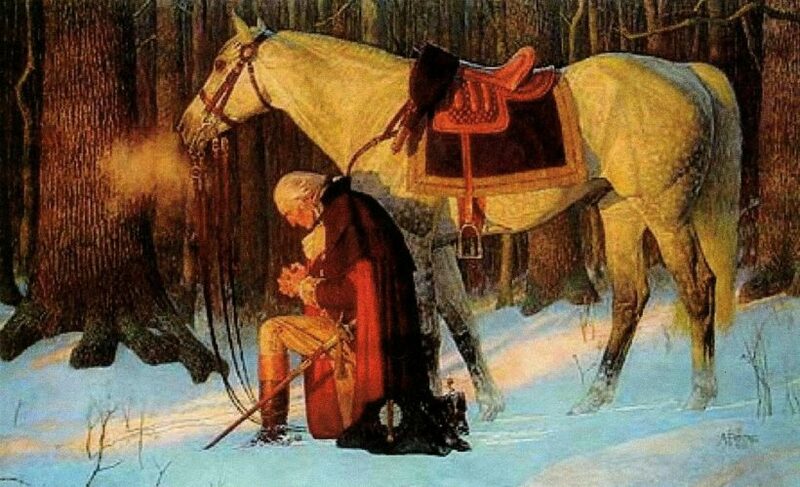 May we also do our part to accomplish George Washington’s desire that this land would be governed by laws and elected stewards who are faithful to the Constitution. Only through our dedication, combined with the benefit of the continued care of Divine Providence, will we ensure that the next generation will have both prosperity and freedom to celebrate. This article was first posted at AmericanThinker .com on November 24, 2011. Reprinted here November 20, 2014 for educational purposes only. 1. What is the main idea of Joseph Ashby’s commentary? What are you thankful to God for this Thanksgiving?